It’s almost criminal that the snitch will walk in a probe involving SAC Capital. Mathew Martoma, an ex-trader at Steve Cohen’s $14 billion hedge fund firm, faces possible jail time for alleged insider trading. But the doctor accused of giving him secret data doesn’t – he won’t be charged after agreeing to help prosecutors. Flipping suspects to land bigger game is standard. Going easy on serious wrongdoing shouldn’t be. Martoma’s alleged crimes stand out even among the scores of recent insider-trading prosecutions. He’s accused of illegally helping SAC reap $276 million in profits made and losses avoided, a record amount for such cases. Enforcers say his recommended trades came after consultations with Cohen. Though the hedge fund titan isn’t accused of wrongdoing, it’s the first time he has been linked to suspicious transactions. Almost lost in the hoopla, however, is the snitch at the heart of the alleged scheme. Sidney Gilman, a neurology professor, consulted with Elan and Wyeth on an Alzheimer’s drug the two developed, chaired the committee overseeing the drug’s safety and sold investors his expertise through a research firm. In each case, he explicitly promised not to reveal confidential information. Yet according to prosecutors he repeatedly broke that promise by passing tips to Martoma. As U.S. Judge Jed Rakoff recently explained in sentencing former McKinsey boss and Goldman Sachs director Rajat Gupta for insider trading, that crime is based on a breach of trust: revealing a company’s secrets. Trading on those secrets is a necessary but almost incidental element of the crime, in the sense that the breach must come first. Yet prosecutors seem to have things backwards. In the Martoma case, they are pursuing the trader while settling on favorable terms with Gilman, who allegedly violated his employers’ trust. And in seeking a stiff sentence for Gupta, they stressed the money that traders made from his tips rather than his disloyalty in revealing Goldman’s secrets. Their tactics are understandable, to a point. The federal sentencing guidelines punish lucrative but illegal trades more harshly than breaches of confidence. And insider-trading doctors probably draw fewer headlines than high-profile hedgies. But prosecutors have broad discretion in choosing whom to pursue. The SAC probe suggests that they don’t always use it wisely. 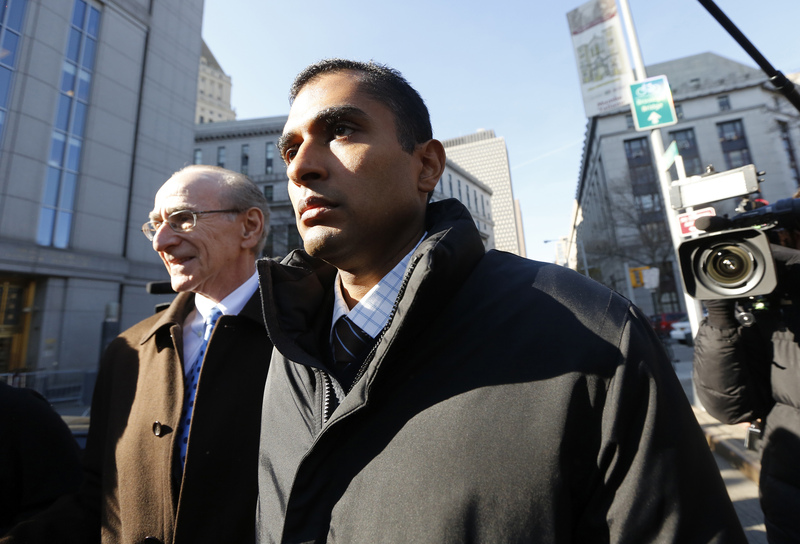 Former SAC Capital employee Mathew Martoma exits Manhattan Federal court following an appearance on insider trading charges in New York November 26, 2012. Martoma was released on $5 million bail on Monday after making his first appearance in a New York court on charges of making illegal trades that hedge fund titan Steven A. Cohen personally signed off on. Mathew Martoma, a former SAC Capital portfolio manager, was released on $5 million bail after making his first court appearance on Nov. 26 in connection with insider-trading charges. U.S. prosecutors say SAC head Steven Cohen signed off on the trades at issue, though Cohen has not been accused of any wrongdoing. Martoma allegedly received confidential information from Sidney Gilman, a doctor who was involved with the development of an Alzheimer’s drug by Elan and Wyeth. Having sold his shares and placed short trades on the stocks before a negative public announcement about clinical trial results for the drug, Martoma and SAC netted $276 million in profits made and losses averted, according to prosecutors. The U.S. government has agreed not to prosecute Gilman in exchange for his cooperation.